Narrative of the United States Exploring Expedition. During the Years 1838, 1839, 1840, 1841, 1842. By Charles Wilkes, U.S.N., Commander of the Expedition, Member of the American Philosophical Soceity, Etc. In Five Volumes, and an Atlas. Printed by C. Sherman, Philadelphia, 1844. [Vol.4, Chapt.XII, p.467 and p.468] ... Cornelius, or Bighead, whose native name is Silimxnotylmilakabok, is chief of the Spokane tribe -- not by birth, but having gained the station by his shrewdness. With the title, however, he has acquired but little real authority, although he is the most influential of the Flathead nation; for his commands are often opposed with impunity by the lowest vagabond, and he himself is sometimes personally insulted without fear or danger of punishment. The dignity of rank, therefore, it will be seen, is not looked upon with much respect among these tribes. Cornelius is about sixty years of age, tall and slender, with a dignified carriage; has a thin wrinkled face, and a far-retreating forehead. He has an expression of intelligence and self-possession, which impresses a visitor very favourably. He is represented as being very pious; and, as far as outward appearances and loud praying go, is certainly entitled to be so considered. * Within the last year, the craters on top of Mount Rainier and Mount St. Helen's have been in activity. was found at the U.S. Library of Congress Website (2007). [Vol.4, Chapt.IX, p.358-359] ... In one of our rides [from Fort Vancouver] we visited the site of the first fort at Vancouver: it is less than a mile from the present position, and is just on the brow of the upper prairie. The view from this place is truly beautiful: the noble river can be traced in all its windings, for a long distance through the cultivated prairie, with its groves and clumps of trees; beyond, the eye sweeps over an interminable forest, melting into a blue haze, from which Mount Hood, capped with its eternal snows, rises in great beauty. The tints of purple which appear in the atmosphere, are, so far as I am aware, peculiar to this country. This site was abandoned, in consequence of the difficulty of obtaining water, and its distance from the river, which compelled them to transport every article up a high and rugged road. ... I also visited the grist-mill, which is situated on a small stream ... From the mill we crossed over to one of the sheep-walks on the high prairie. ... We reached the fort just at sunset, after a ride of twenty miles. It was such a sunset as reminded me of home: the air was mild, and a pleasant breeze prevailed fromt he west; Mount Hood showed itself in all its glory, rising out of the purple haze with which the landscape was shrouded. [Vol.4, Chapt.XII, p.451] ... Mount Rainier, from the top, bore south-southwest, apparently not more than ten miles distant. A profile of the mountain indicates that it has a terminal crater, as well as some on its flanks. The barometer stood at 24.950 in. : five thousand and ninety-two feet. There was another, to the north-northeast, covered with snow, and one to the west appeared about two hundred feet higher than the place where the observations were taken. [Vol.4, Chapt.XII, p.455] ... From the summit of one of the hills, a sketch of Mount Rainier, and of the intervening range, was obtained. ... Cornelius, or Bighead, whose native name is Silimxnotylmilakabok, is chief of the Spokane tribe -- not by birth, but having gained the station by his shrewdness. With the title, however, he has acquired but little real authority, although he is the most influential of the Flathead nation; for his commands are often opposed with impunity by the lowest vagabond, and he himself is sometimes personally insulted without fear or danger of punishment. The dignity of rank, therefore, it will be seen, is not looked upon with much respect among these tribes. Cornelius is about sixty years of age, tall and slender, with a dignified carriage; has a thin wrinkled face, and a far-retreating forehead. He has an expression of intelligence and self-possession, which impresses a visitor very favourably. He is represented as being very pious; and, as far as outward appearances and loud praying go, is certainly entitled to be so considered. ... NOTE: Vol.4, Chapt.XII, covers the year 1841, with the narrative published in 1844. Depending on when this last line was added, gives a date range of ca.1841-1844 for Rainier and St. Helens. [Vol.4, Chapt.XII, p.440] ... The height of Mount Rainier was obtained by measuring a base line on the prairies, in which operation I was assisted by Lieutenant Case, and the triangulation gave for its height, twelve thousand three hundred and thirty feet. While engaged in these duties, I noticed from a point of the prairie, the white cones of both Mount St. Helen's and Mount Hood very distinctly. These mountains all resemble each other closely, and appear in some points of view as perfect cones. They give great interest and grandeur to the scenery. Mount Rainier is at all times a very striking object from the prairies about Nisqually, rising as it does almost imperceptibly from the plain, with a gradual slope, until the snow-line is reached, when the ascent becomes more precipitous. The ascent of these mountains has never been effected, but it was my intention to attempt it, if my other duties had permitted, as I was very anxious to get a view of their terminal craters. The absence of the Peacock, however, and the great amount of work necessarily devolving on the rest of the squadron, made it impossible for me to undertake this additional labour. "Shasty Peak", drawn by A.T. Agate, engraved by G.B. Ellis. 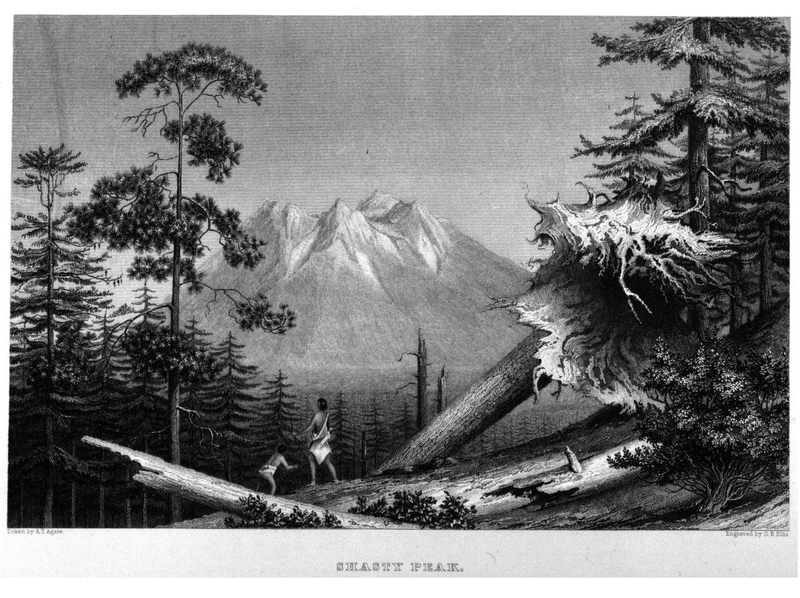 -- Information courtesy College of the Siskiyous Mount Shasta Collection website, 2011: The earliest known picture of Mount Shasta was sketched by Alfred Thomas Agate. This picture, entitled 'Shasty Peak', was drawn in 1841 and first published in 1844 as a full page steel engraving in Volume V of the five volume report by the commander of the expedition, Charles Wilkes. The report, titled the "Narrative of the United States Exploring Expedition, 1838, 1839, 1840, 1841, 1842" was published by Congress and limited to one hundred copies, many of which were sent to foreign heads of state, and most of which have been lost. Wilkes was granted a special copyright on the volumes, and he privately published 150 more sets. Later he issued an additional 1,000 sets. Many trade editions were published in the decade to follow, the last being printed in 1856. But only the earliest three editions contain the engraving of Mount Shasta. [Vol.5, Chapt.VII, p.255-256] ... On the 3d, they continued their route up the plain, and soon reached its termination, after which they entered the forest on the slopes of the Shaste Range; their bath was rendered very broken and uneven by the knolls of trachyte which were seen in every direction. On arriving at the top of the ridge, they had a magnificent view of the snowy peak of Shaste, with a nearer and intermediate one destitute of snow, with tall pines growing nearly to its top. Where the surface could be seen, it appeared as though it was covered with large blocks of rock: its conical shape proved its volcanic character, although no crater could be perceived. The Shaste Peak is a magnificent sight, rising as it does to a lofty height, its steep sides emerging from the mists which envelope its base, and seem to throw it off to an immense distance; its cleft summit gave proof of its former active state as a volcano. The snow lies in patches on the sides and part of the peak of this mountain; but there is a great difference in the position of its snow-line from that of Mount Hood or St. Helens's. Its height is said to be fourteen thousand three hundred and ninety feet, but Lieutenant Emmons thinks it is not so high. After passing this ridge, they soon met the head waters of the Sacramento, flowing to the southward, and their camp was pitched on the banks of another stream, that came from the Shaste Peak.